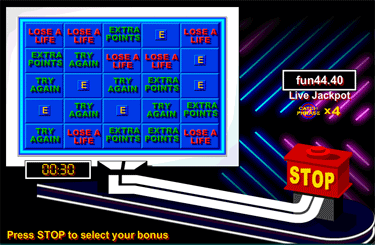 At best, Catchphrase is a disappointing online TV quiz game. It combines the Catchphrase quiz show format with the game of hangman, but ends up with something that’s not quite as good as either. Quiz games that are based on TV shows are usually gimmicky and fun, but Roy Walker’s interjections only worsen an already dire game. I think I’ll stick to getting my dose of Catchphrase to when I can’t find anything better to watch on daytime TV. If you’re after a good TV quiz game, try Bullseye. Online game rating - 27%. Catchphrase is slow, very slow. And as s a rule of thumb, slow is never fun. The one and only bonus round tries hard to inject an extra dimension to the game, but it feels like a last minute addition rather than a clever strategical area of the game. Even after you persevere and peel back the slow gameplay you are left with an unfulfilling game of hangman with more slow-loading questions plastered over the top. All in all, the Catchphrase online game is very one-dimensional, which makes for a totally uninteresting and dull game. The basics of this version of the quiz game. Randomly select how many points you will win from the game. Press the buzzer when you think you know what the catchphrase is, but it doesn’t really matter if you do or not. Play a drawn-out game of hangman, selecting one letter at a time to complete the puzzle. For every letter you select you have to answer a question. The more games you win the more points you will accumulate. The more points you have the more money you can win. It’s an elaborate and slow game of hangman really with questions in the middle. Catchphrase game in more detail. Before you start answering questions you need to press the buzzer to randomly select how much the game will be worth in points. You will then be shown a catchphrase. Click the buzzer when you think you know what it is and the game of catchphrase hangman will begin. In each game you will have a choice of 3 letters. Some of these will complete the catchphrase and others will not. If you choose an incorrect letter, you lose a life. You have 6 lives in total before the game is lost. If you choose a correct letter, you have to answer a question before the letter fills in any blanks of the catchphrase. After you have completed the entire catchphrase the points will be added to your tally. You will then have the option of collecting your winnings or playing on to win more points and more money. Add a letter - adds one letter to your current catchphrase. Extra letter - offers you a letter that may or not be in the catchphrase. Extra letters - same as above, but you’re offered more than one letter. Complete phrase - completes the catchphrase and wins the current game for you. Extra points - more points are added on to the game for you to win after completing the catchphrase. Try again - gives you an extra try again. Super try again - give you two extra try again’s. Spot prize - an instant prize as indicated at the time. Catchphrase logo - adds an extra catchphrase symbol to your jackpot release tally. Lose a life - lose one of your lives for guessing the correct letters. Game over - instantly loses you the game. Tip: There is some skill involved in stopping the selector in this bonus round, so try clicking when the highlighted square is in one of the safer areas. When it comes to choosing letters to complete the catchphrase (and during the bonus round), you will have the opportunity to collect "Catchphrase" logos (or symbols, whatever they are called). If you collect enough of these you will release the current jackpot bonus for the game as indicated in the game window. It’s often a good idea to try and win the bonus if you can, as it will result in a bigger win than if you just try and complete the catchphrases over and over again for points.